Bank Routing Numbers | What is a Routing Number? Bank Routing Numbers | What is a Routing Number? Bank routing numbers definition and FAQ. Learn how to find your bank’s routing number on a check, online or from the ABA website. A Bank routing number, ABA number or Routing Transit Number (RTN) is a 9-digit number, which is used to identify a financial institution or bank in a transaction. The Routing Number system was originally designed for the sorting and shipment of paper checks back to a check writer’s account, but nowadays the the system also accommodate new payment methods, like ACH and Wire Transfers. The bank routing numbers are also used by the Federal Reserve Banks to process Fedwire funds transfers, and by the Automated Clearing House to process direct deposits, bill payments, and automated transfers. ABA Routing Number system was developed in 1910 by the American Bankers Association (ABA). There are approximately 28,000 issued routing numbers. Larger banks and credit unions often have multiple routing numbers that serve different regions or branches. Incoming international wire transfers also use the SWIFT code system (SWIFT-BIC). European banks do not use the US routing number sytem, but an IBAN code. You can find your bank’s routing number printed on the bottom left side of a check. The routing number are also listed on the websites on banks and financial institutions. How can I find my Routing Number without a check? Visit your bank’s website and search the website for routing number information. If many routing numbers are listed for different states or regions, then look for the state, where you opened the account. If you bank online, you can often see the routing number under ‘Account Information’ or on your online statement. You can also look up routing numbers on ABA’s Official Website. Scroll down and click “Agree” at the bottom of the user agreement. On the search page, enter your bank’s name and the state and zip code of the bank branch. Find the routing number with the listing for the address of your bank branch. Where is the Routing Number on a Check? The bank routing number for your local bank is always printed on the lower left side of your checks. The number in the middle is usually your account number, and the number on the right side of the check is usually the check number. Your routing number is always on the LEFT side, however, and it will always be a nine digit number. The first two digits of the nine digit routing number will always be in the ranges from 00 through 12, 21 through 32, 61 through 72, or the number 80. 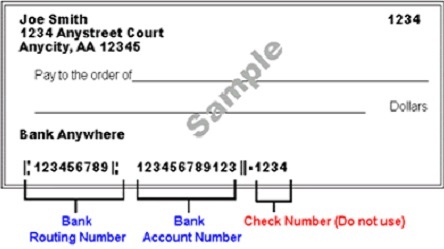 Example on how to find the routing number an account number on a check. Please, search our website to find specific routing number for all major US banks.